I saw somewhere that Eric Ripert got himself a custom-made 56k Louis Vuitton case to hold his knives. you should take care of your tools, always have them clean and organized. If so then follow my tips. There are some important things you have to do. it for a while. Clean them immediately. Dry your knife. Right after cleaning it dry it with a towel. Don’t let them air dry since that can cause rust. excessive washing in the dishwasher they will start chipping. So if not in the dishwasher how am I supposed to wash my knives? Isn’t this the most effective way to clean them? You have to wash them by hand if you want them to last longer. Soak them for a bit in warm soapy water. Dry the knife. As I mentioned above you should never leave your knives wet. A garbage disposal is an amazing convenience in a kitchen, but nobody likes to discuss or clean it. A garbage disposal should be cleaned every month in order to maximize its lifespan and prevent bad odour that can spread through entire house. We all probably procrastinate and postpone cleaning of the appliance or we simply don’t have time for that. However, in order to get rid of the terrible smell caused by food crumps, sludge and various bacteria, we have to clean it regularly. Here are steps on how to do it efficiently and quickly. As far as the first step goes, before you do any cleaning, make sure you turn off the appliance. 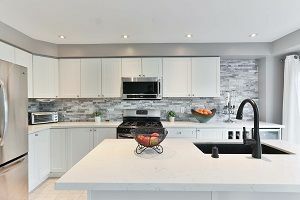 After this step, you want to continue by removing any blockage and food fragments by reaching into the disposal with a kitchen pliers or similar tool. Be careful when cleaning around the blades so that you do not damage or break them. After that, you want to focus on cleaning the blades or grinders. Put some ice into garbage disposal, and a cup of salt and vinegar. After you run the cold water, turn on the appliance and let the disposal work for few seconds. 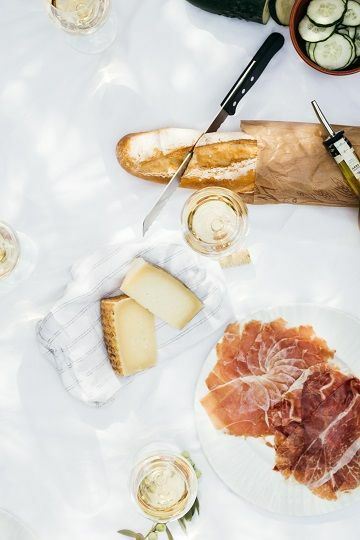 The ice will help you clean those food particles and any other blockage and sharpen the blades, while the vinegar and salt will neutralise the smell. The next step includes cleaning the appliance’s drainage system by rinsing down any scraps. What you need to do next is plug a drain with a stopper and fill the sink with water. You can add some dish detergent for better results. Then, let the water drain with garbage disposal running at the same time. Weight and gravity of water will rinse down any remains that are stuck in the pipe. 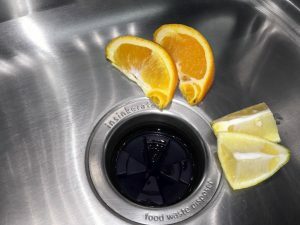 If your garbage disposal still has a bad smell, there is a great solution that will make it fresh for a long time. 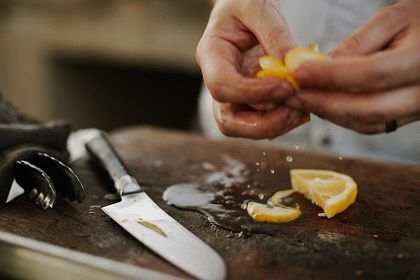 Take a lemon or an orange and cut it in 4 pieces. After you place in them in the sink, run cold water and turn on the appliance. Citrus acids will neutralize the smell and will keep it fresh for some time. Additionally, you can use baking soda and vinegar to achieve great results. Pour the mixture into drain and wait for 10 minutes. Flash with boiling water while the garbage disposal is running. In order to expand its lifespan, take care of your garbage disposal. Remember that you can put only biodegradable food into the appliance. It is not a trash bin and you need to avoid putting things that will damage or break it, such as potato peels, onion skins, celery stalks, or stuff that expand from the water (rice). On the other hand, items you can grain up and which will actually clean the garbage disposal are small fish or chicken bones, egg shells, etc.